What Serving Options Do You Offer? When it comes to party catering services, you’re likely to have some options regarding how the food is served. Stationary appetizers (meaning they’re provided but simply arranged on a table) are generally the most affordable, followed by passed hors d’oeuvres (meaning servers carry trays around). If you’re looking for full dinner service, you’ll likely be able to choose between a buffet and plated sit-down service. What Equipment Do You Provide/Need? Most catering companies will provide at least some of their own equipment and dishes, but not all. Make sure you know in advance so you can budget accurately and have everything that’s needed on the day of the event. Depending on where you’re holding your event, your caterer may or may not be able to provide alcoholic beverages. If not, you can at least ask for drink suggestions that will pair well with the menu. Beer is the most popular choice among American drinkers; a 2014 survey found that 41% of drinkers typically drink beer, as opposed to only 31% who drink wine and 23% who drink liquor. Beer is even more popular among younger people, as 48% of 18- to 34-year-olds selected beer as their favorite alcoholic beverage. Popular craft beers may be a good choice, but you’ll almost certainly want some guidance to pick the right ones; a full 84% of people who like craft beer say their preferences change by the season. How Do Your Servers Dress and Interact? If you’re hiring professional catering services, you’ll want to make sure the demeanor of all the servers is as professional as the food. Ask about serving experience, and be sure to specify how dressy your event will be so the servers look the part. Can You Accommodate Last-Minute Requests? The more accurate you can be with your head count and plans, the better. But things don’t always go as planned. Ask in advance what deadlines the caterer absolutely must work with and which can be bent. 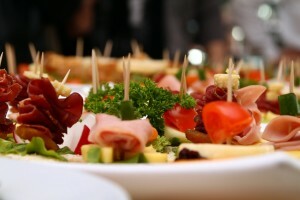 What else might help aspiring event planners when vetting professional catering services? Join the discussion in the comments.